THE COVER-UP TO COVER ALL SEASONS!! In a NEW for SS19 Shattered Glass inspired print, this Limited Edition multi-way design was created for warm-weather getaways - yet throw it on over a black top and Travel Tights, add heels, and it’s just as at home in city. It has adjustable snaps creating sleeves and a v-neck, plus you can add a Sleeve/Sash or Scalloped Sash to the waist for definition. A beautiful layering piece for traveling, ideal for leisurely locales and luxe lounging. 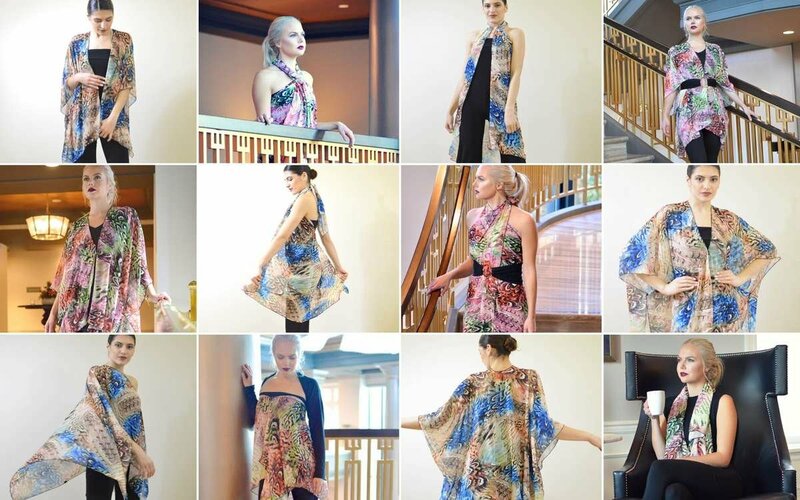 The Butterfly Wrap fits in your beach bag and can be worn as a shawl, skirt, dress, kaftan, tunic and more. Dress it up for evenings or wear it to the beach over your bathing suit. Designed to be One Size and easy fitting for all body types. This look is great with the sleeve and sash used as a belt and travel tights. For even more looks add a matching Scalloped Sash. See what customers are saying about our collection here. Our Wrinkle-Free Chiffon is the ideal travel fabric made from a high-quality easy-care wrinkle-free microfibre. Very similar to silk chiffon but much more durable with a lightweight, silky-soft finish. Think of comfy elegance. We love it for it’s quick dry, wrinkle-free, and easy care qualities that will easily take you from the beach to a night out.